In this very interesting and suggestive VIS image, taken by the NASA - Mars Odyssey Orbiter on July, 14th, 2002, and during its 2.569th orbit around the Red Planet, we can see (once again and after the APODs of May, 18, 2014 and January 7, 2013 - see the Archives, if you wish) a small portion of the Martian Volcanic Area known as Nili Patera. Nili Patera (as well as Meroe Patera) is (are both) located in the dark Martian Region known as Syrtis Major Planum, which is centered near 8�� and 24�' North Latitude and 69�� and 30�' East Longitude. Syrtis Major Plaum extends for about 1500 Km (such as approx. 931,5 miles) - to the North from the Red Planet's Equator - and spans approx. 1000 Km (such as about 621 miles), from West to East, in the Syrtis Major Quadrangle. 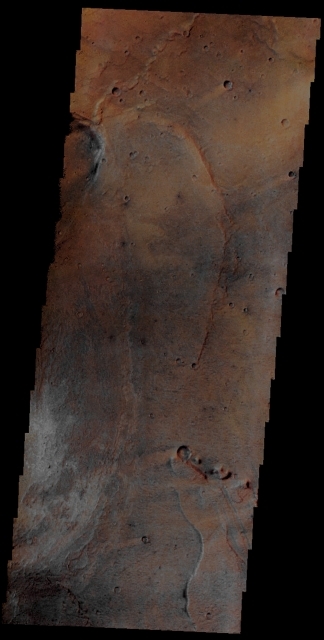 This image (which is an Original Mars Odyssey Orbiter false colors and Map-Projected frame published on the NASA - Planetary Photojournal with the ID n. PIA 19004) has been additionally processed, magnified to aid the visibility of the details, contrast enhanced and sharpened, Gamma corrected and then re-colorized in Absolute Natural Colors (such as the colors that a normal human eye would actually perceive if someone were onboard the NASA - Mars Odyssey Orbiter and then looked down, towards the Surface of Mars), by using an original technique created - and, in time, dramatically improved - by the Lunar Explorer Italia Team.